The fourth volume of Shigeru Mizuki’s Showa series is coming out next month from publisher Drawn & Quarterly, and I can’t wait! I published my comprehensive review of the first three volumes of his work — as well as his other graphic novels — in World Literature Today as a feature article. It looks great in the print magazine, but it’s not online, so I published it on Medium.com. (I can do this under our contract, since WLT is cool like that.) Mizuki is fantastic and I put some time into this one. I published a feature article about Shigeru Mizuki’s phenomenal Showa graphic novels in this month’s World Literature Today. Shigeru Mizuki is a pioneer of Japanese manga who only has one arm! The article is not online but it is beautifully laid out in the magazine — grab yourself a copy by ordering it here. I was thrilled to be featured as recommended reading in The Guardian. You can read the article here. I was honored to read from my short story We Are the Olfanauts at the launch of Watchlist: 32 stories from persons of interest, published by O/R Books. The reading took place at babycastles, a cool video game hacker space in the West Village of Manhattan. You can get a copy of Watchlist here or read my short story in Electric Literature here. I’m getting excited for the new film Jurassic Park World. I’m an admirer of Michael Crichton, so much so that I published a piece in the New York Review of Science Fiction called How to Write Your Own Jurassic Park. You can read it on Medium here. 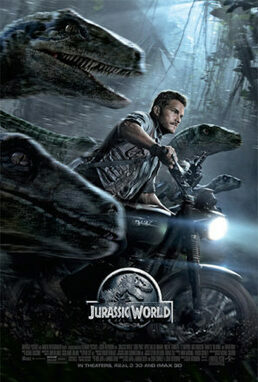 I’ll admit that the poster of actor Chris Pratt riding a motorcycle with a pack of velociraptors does not inspire confidence. Why? First, it’s dangerous to ride a motorcycle without a helmet. Second, a helmet would protect him from deadly velociraptor attacks. And third (this is the one that I fear the most), it may be that his character has tamed the animals somehow with an embedded chip (the Internet of Dinosaurs) and for some reason, some completely ridiculous reason, they are now running beside him and following his orders with the docility of bloodhounds. But this photo, of a mosasaurus eating a great white shark, does get me excited. Why? Because I played (and finished) this Jurassic Park game by Telltale Games. The mosasaurus level was among the most creative and enjoyable to play. Let’s see if it has translated to the full screen.